Skip February 5, 2018 FEATURE STORY, Slide No Comments on How the west was won. Wanda Taylor speaking tour starts this week. Women are not small men; they are women. Today, they are 25% of the fishing population. No wonder vendors are paying attention. Quietly, Wanda Hair Taylor has become the current day Joan Wulff: visionary, glass ceiling terminator, professional casting instructor, and in Wanda’s case, the beat behind the bushes that’s finally getting manufacturers to make clothing and equipment designed specifically for women. Wanda’s business acumen has to stead her well. Early on, she saw that TFO was going to make it. She’s been on their Advisory Staff Member 20 years. It’s been a successful marriage for TFO – she’s a dedicated champion of their products. Like Joan Wulff, Wanda has lots of firsts. One such first is as impressive as Joan’s triumphs at winning casting tournaments. 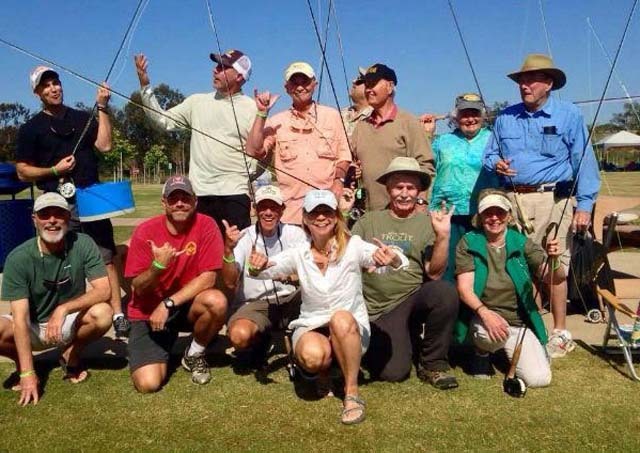 Taylor is the first woman ever to become a Master Certified Casting Instructor by the International Federation of Fly Fishers, now called Fly Fishers International, and she owns Wanda Taylor’s Fly Fishing/Casting School. Fly Life Magazine.com: Wanda, what’s next on your schedule after this Atlanta show? Wanda Hair Taylor: I fly to Los Angeles, California, on Tuesday for a ten-day speaking tour to the CAL 7. Each club has a newsletter with my schedule (day, date and time) at their respective clubs. FLM: Do you have the schedule? WHT: Yes. Interested parties can contact the individual clubs listed below for more information. FLM: Didn’t you have an article in Jen Ripple’s DUN recently? WHT: Yes, an article on fishing extreme northern Manitoba, Canada, for northern pike, walleye, giant grayling, and snorkeling with Beluga Whales. It all took place in the land of the Northern Lights and polar bear capital of the world. You can access online Dun Magazine “Firsts” in the winter edition. WHT: Yes, another one coming out in Sportsmans Journal’s March/April issue about my breaking the women’s world record on 25-pound tippet class on a fly for blue marlin. The world record was 90-pounds. My 1st was 125-pounds, 2nd 280-pounds, and third was “zing pow” weighing in at 380-pounds. We released all three in Costa Rica, but captured every moment on GO-PRO. We are hopeful that the filming, so doable for the average Joe, that there will be a new mindset of ing world records- release without killing. Contact Wanda . . .
More About Wanda . . .